If you have purchased the All Access Bundle, you need to use the theme or plugin key, not the Bundle one. 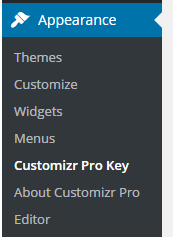 For example, if you want to activate Customizr Pro, you'll need to use the Customizr Pro key, not the Bundle one. Here are the simple steps you need to follow to enable and activate your licence key for a theme like Customizr Pro. It is important to save always first and then click on activate. Even if you need to replace one licence key by another. Upload and enable the plugin from your WordPress Admin in plugins. Once the plugin enabled, navigate to Plugins > Press Customizr Keys. Then save and activate and you're done. If you get the following message when activating your product "number of activation exceeded ...", it means that you need to upgrade your plan to activate the theme or plugin on more WordPress websites. How will I receive and where can I download the files of my purchased product ?